The intervention was carried out in January 2005, during the so-called “Gedenkjahr” (commemoration year) that was announced by the Austrian government. Since 2000 Austria had been governed by a coalition of the conservative party (ÖVP) and the right-extremist populist party (FPÖ). During that year a number of anniversaries were celebrated and the government launched a number of dubious art projects in public space. 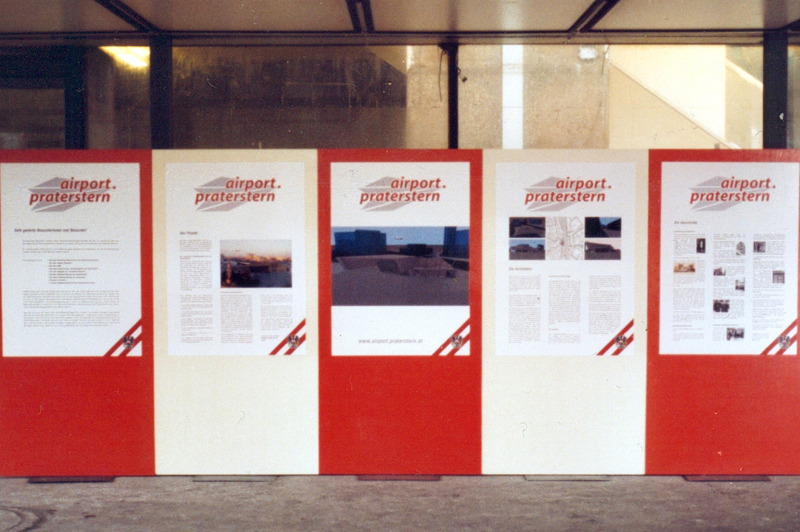 Austrian artists and cultural workers initiated a series of counter-projects; Airport Praterstern was one of them. Praterstern is a regional railway station at a central location in Vienna that was under reconstruction in January 2005. Before WW2 the Praterstern had been Austria’s largest railway station. It was the arrival point for tens of thousands of Jews immigrating to Vienna as well as the point of departure for deportations to concentration and extermination camps during Nazism. Without the authorities’ permission we put up a presumably official information booth by using the insignias of the Republic of Austria. In the name of the Republic we announced the launch of the initiative Niemals Vergessen (Never Forget), which combined a utopian construction project and a shift of paradigm in terms of how the Republic deals with the Jews expelled from Vienna during Nazism. The construction project was a new airport at Vienna’s Praterstern and it was presented to the public through the information booth, radio shows, newspaper articles, a website and an online discussion forum. It served as an eye-catcher for the utopian message announced on all project materials: Since the year 2005 represents, amongst other, anniversaries the liberation from Nazism, the Republic of Austria has finally decided to compensate for its decade-long failure to assume its responsibility towards the victims of Nazism and push forward the active process of coming to terms with the country’s Nazi past. (Thomas Prlic: Falter 1-2/2005) Dass der Praterstern umgebaut wird ist bekannt. Dass aus dem Wiener Nordbahnhof ein innerstädtischer Flughafen werden soll, hat sich aber noch nicht herumgesprochen. 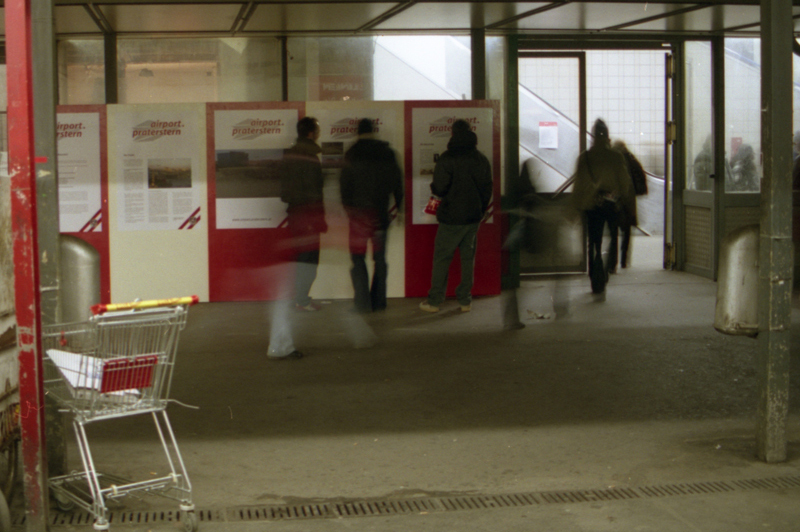 (Augustin, Jänner/2005) Seit Monaten kursierte bereits das Gerücht um die Entstehung eines Jahrhundertprojekts am Standort des jetztigen Bahnhofs Wien-Nord. (Gitti Hell: malmoe, 17.1.2005) Ein recht ungewöhnliches Projekt, das die "Organisationsgruppe airport.praterstern" Anfang Jänner einer handverlesenen Schar von überraschten PressevertreterInnen vorstellte. © Eduard Freudmann. All rights reserved.